Gonzalo Arbutti is a Argentinean artist born in 1972. He lives and works in Buenos Aires. When he was a kid, he used to spend a lot of time in the workshop of his grandfather, who was a naval mechanic. Since then, he grew a passion for working pieces and making objects. He studied design, visual communication and Fine Arts in La Plata, a city nearby Buenos Aires. Then, with a friend of his, also designer, he funded the brand Cubo; 12 wooden toys, thought for the motricity and learning of the kids, has a great success. They are first sold at the Museum of Latin American Art of Buenos Aires (MALNA) and then at the MoMa, in New York. After 5 years, the Cubo adventure ends. 3 years ago, Gonzalo settled in his own workshop in the neighburhood of Chacarita, in Buenos Aires. Here, he teaches carpentry and realizes special orders. He also exposes in the Praxis Gallery, in Buenos Aires and New York. When we enter his workshop, his dog Rafi welcomes us. We first enter a room full of his creations; toys, sculptures, objects… Passersby stop a while, intrigued, to admire his beautiful display. 1) Your creations are much diversified; what are their common point? How would you define your work? The limit line between design and art is very thin. I hate when people try to give me some kind of official title: carpenter, artist, designer, sculptor… everything, at last, connects. What’s really passionate me since the very beginning is studying the forms and the morphology. Especially when those forms repeat infinitely, like tantric patterns. A lot of my work is inspired by those repetitions. What I love about shapes is seeing them from a new perspective. I have, for example, a little story about Autotop, the car we designed with Mon Petit Art. I was making a wooden skateboard and the piece that linked both wheels caught my attention. I took it out, looked at it a little closer… and it looked like a little car! I kept working on it, and Autotop was born. Design doesn’t exist; only morphology does! What inspires me the mystery of creating. The shape appears bit by bit between our hands. It’s some kind of magic. Spontaneity is very important when it comes to creation. That’s why I usually use wood; it’s a good material to curve very quickly the shape you had imagined. Steel, for example, is not so easy to work: it takes more time to transform it. Also, I have a great connection with the smell and the texture of wood. However, spontaneity doesn’t mean that my work is not refined! I really pay attention to the colors and the shapes. 2) You work with Mon Petit Art since the very beginning. Can you tell us a little bit about your collaboration? I met Lucila, the founder of Mon Petit Art, more than 15 years ago, in 2000. She used to come regularly to the Cubo boutique to buy toys for her children. We really share our vision of toys and their role in children learning and imagination. In that time, Lucila had already the idea to fund her own brand of toys and artistic activities. We talked a lot about it. When Mon Petit Art started, from the beginning, we created toys together and it worked out well! With Mon Petit Art, we transformed my creations into games. We asked ourselves how we could touch the sculptures, how we could play with it. For example, Triada is a construction game directly inspired by my wefts; it’s like the wooden pieces were taken out from the sculpture! 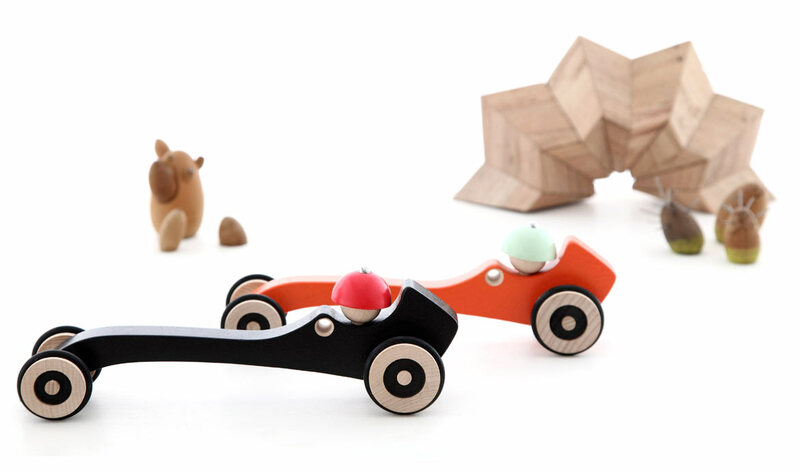 One of the most emblematic pieces of Mon Petit Art is Robotop, a wooden articulated robot. It comes from the fact that I love ensemble pieces and textures together. The idea of the robot came naturally; I was born in the 70’s, when we saw the future as robotic, it is part of my imaginary. 3) Your creations have a very playful dimension. How do you connect with toys and games? All my work is linked to the action of playing. I always try to create playful objects. I studied the “homo ludens” concept: humans are meant to play and games are the bases of our culture. Society games, like Monopoly, really annoy me. Even more; it makes me very nervous to follow all the games rules. I’m more interested in the object of the toy itself. Everything starts with a toy! When the baby touches it, it touches for the first time something that’s not his own body of its parents, and there is a connection. The relation between toys and space is also interesting. This conception is very present in all the games we made with Mon Petit Art. For example, Triada Star is a game that has a very interesting form; pieces can interlock in many ways. Or the game Mini Cubes; it’s a big cube that fragments in many little pieces, of different sizes and proportions: there are so many ways to combine them and occupy space! You liked Gonzalo Arbutti's work? Discover all his creations for Mon Petit Art on our eShop !